The Lower School, grades PreK to fourth, employs a multi-faceted approach to learning, teaming academic challenges with “real life” experiences for the children. Combining multi-sensory methods to content areas allow the students to “see it, do it, and touch it.” The units of study are project based in the prekindergarten and kindergarten, and multi-disciplinary in grades one through four. Overarching themes direct the areas of study that promote asking essential questions that generate interest and excitement in the process of determining answers. Teachers also consider student readiness levels, learning styles, and interest for their students and incorporate specific strategies that focus on needs and academic challenge. Opportunities for learning are not limited to the classroom, and a comprehensive approach incorporates perspectives from art, music, science, global awareness and daily physical education, as well as off-campus field trips. Character education and community service are integrated into all areas of school life from the classroom to the playground. Whether it’s singing with senior citizens, making care packages for our troops or donating books for a children’s library effort in Africa, the students have awareness of others that goes beyond the campus walls. 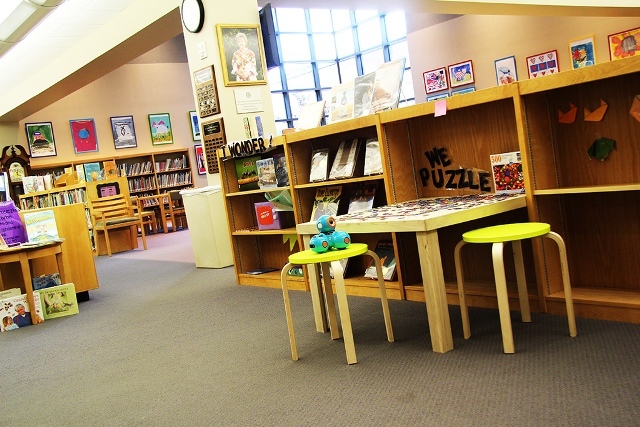 The physical spaces under development in the lower school are primarily housed in the art room, the library, and the technology lab. In our lower school art room, a carpeted spot with a low table and access to a counter provide a space for students to gather. Transitioning from the traditional “technology lab” model toward seamless integration of making, creating, designing, and exploring the world as a maker, we are in the midst of redefining learning environments to expand upon the authentic learning experiences that are already in place in the lower school. By changing our traditional furniture to more mobile and flexible furniture, we will open up the lab space for flexibility. With carts and mobile devices, we have the option to move materials to any area of the school, opening up endless possibilities for maker space learning. The approach to Maker Spaces at Kinkaid Lower School is a multi-faceted program with heavily integrated STEAM components. Transitioning from the traditional “technology lab” model toward seamless integration of making, creating, designing, and exploring the world as a maker, we are at the start of redefining learning environments to expand upon the authentic learning experiences that are already in place in the lower school. In our lower school art room, a MakerBot 3d printer provides students access to create 3-dimensional models using apps such as Cubify, and exploring a variety of tools in integrating the 3-dimensional art into their projects. With the addition of Little Bits, and a space dedicated to tinkering, students are the designers of their own learning. Down the hall in our bright and cheery Jacomini Library, we’ve begun to incorporate small maker spaces in innovative ways. We are currently testing a small table that extends from a shelf, to provide a workspace for a variety of tools. The addition of a photo-booth structure with an ipod and curtain for students to share “Book Selfies” will provide students a place to reflect and share. In the lower school computer lab, changes are underway to create an environment more conducive to collaborative learning and student creativity. With software such as Minecraft, PhotoShop, and tools such as a poster printer, several mobile device labs, and a sound recording station, we’re moving toward learning with embedded technology that maximizes opportunities for student-choice, thinking, and collaboration. With these tools, the lab is poised to become a launch pad of innovation for the Lower School. Rather than being the school makerspace, it will supply the tools to allow any place within the lower school to become a maker space. Additionally, specialists in our Reading, Science, and Music program are embedding innovation within projects that not only excite students, but engage them to think at higher levels. Classrooms can check out robotics and technology devices to enhance projects as well. Students utilizing software to write their own music and practicing high frequency reading with robotics are just the start of a fully integrated STEAM program that we look forward to expanding on. Students are exploring sound recording, video conferencing, digital photography, manipulation of graphics, publishing their own writing, and even digital story creation. The tools such as Sphero, BeeBots, and Little Bits make learning even more hands on and allow students to fully engage in learning experiences that are STEAM integrated. As we continue to develop embedded integration of STEAM learning, we will replace some of our traditional furniture with seating and tables that allows for a more flexible use of a space, and to provide more student voice into the design of their own learning environments. Additionally on the horizon is an exploration of pop up maker spaces, transported by cart, to bring innovative materials into any learning environment within the school. We envision a space where both students and teachers can choose from a variety of tools, devices, and resources to fully unleash their creativity, imaginations, and motivation in a collaborative atmosphere.